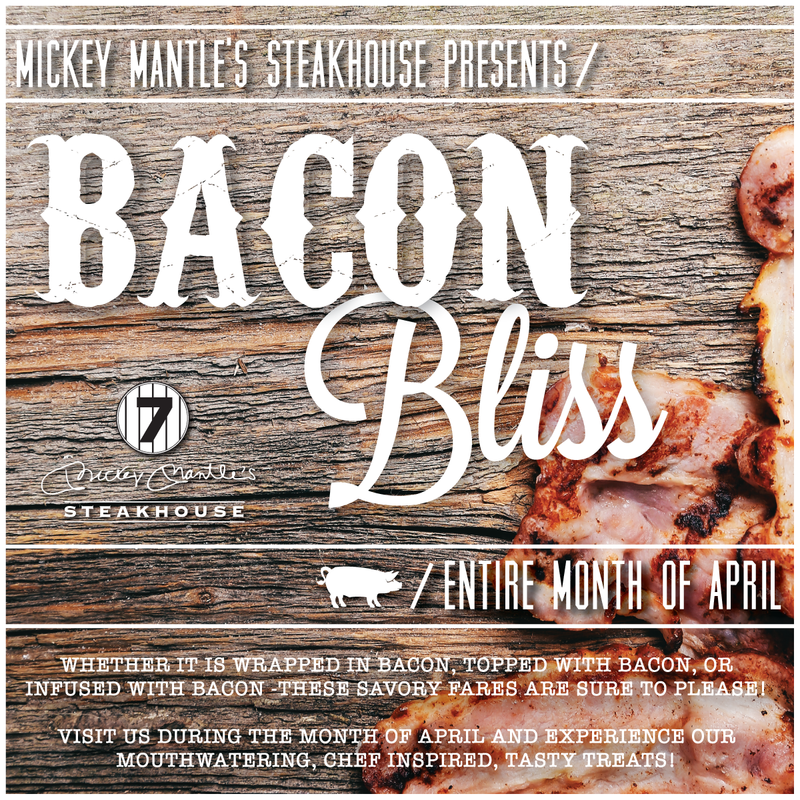 Make your way to Mickey Mantle’s Steakhouse in Bricktown OKC for a month of Bacon Bliss! 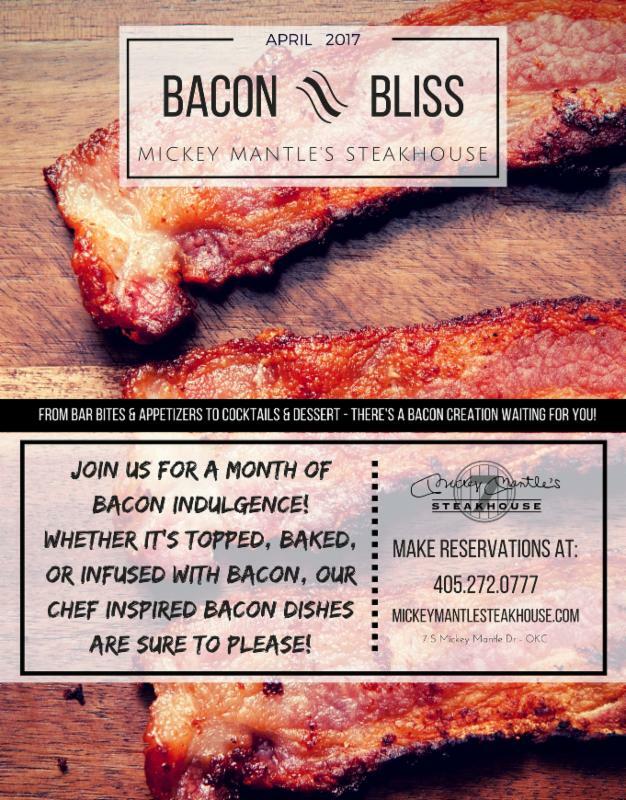 Oklahoma bacon lovers unite at Mickey Mantle’s Steakhouse this month! Chef Torres will be preparing all manner of inspired dishes to delight your taste buds and celebrate the versatility of one of our very favorite ingredients. In addition to the bacon infused items on our main menu, special features for every course from appetizers to desserts will be stuffed, wrapped, infused & crusted in delicious strips of juicy, pork heaven. Every dinner guest will be treated to an amuse bouche to kick of your appetite and ignite your excitement for bacon! 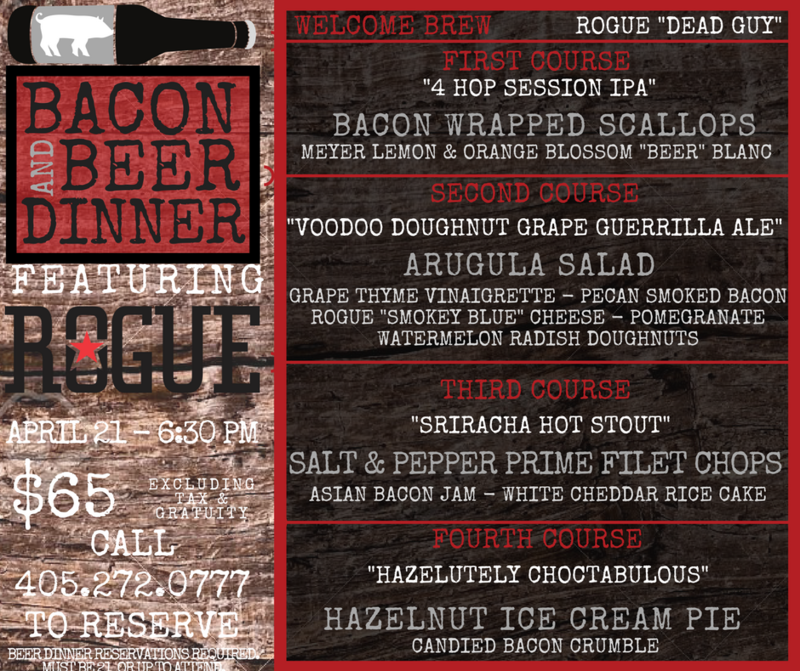 Join us on April 21st for a Bacon & Beer Dinner featuring Rogue Brewery. During this event, attendees will enjoy a tasting of 5 Rogue beers over 4 bacon-centric courses. Guests will also take home some complimentary glassware to commemorate the evening. Seating at this event is limited so call and reference the ‘Rogue Bacon & Beer Dinner’ to reserve. How Much: $65 excluding tax & gratuity. Head over to the bar & 7 Lounge after the Rogue Bacon & Beer Dinner to watch the OKC Thunder take on the Houston Rockets in game 3 of the NBA Playoffs starting at 8:30 pm. Don’t forget to make Mickey Mantle’s your playoff headquarters! Enjoy all day happy hour pricing & show us your playoff ticket to receive $20 off two entrees the day of every home Thunder playoff game! Visit us during the month of April and experience our mouthwatering, chef-inspired, tasty treats! Follow us on Facebook, Twitter & Instagram for the first look at up to date bacon features during the month of April. Call us for regular dinner reservations at 405-272-0777 or visit our OpenTable page to reserve. Reservations for the Rogue Beer Dinner are not available through OpenTable.